I'm just waiting to see what his players think. I bet they just tune him out, lol. All that he is to them is the source of their paychecks, most likely. Edited by Lewd, April 25, 2014 - 11:19 PM. An hour later, still no story on ESPN. Still no Stephen A Smith comments. We just gonna ignore this cause ya'll wanna push the Clippers now? Edited by Majesty, April 25, 2014 - 11:19 PM. Edited by Majesty, April 25, 2014 - 11:23 PM. It's real late on the east coast and maybe, JUST MAYBE, ESPN is waiting for athletes/analysts/commentators/etc to wake up and get higher ratings. 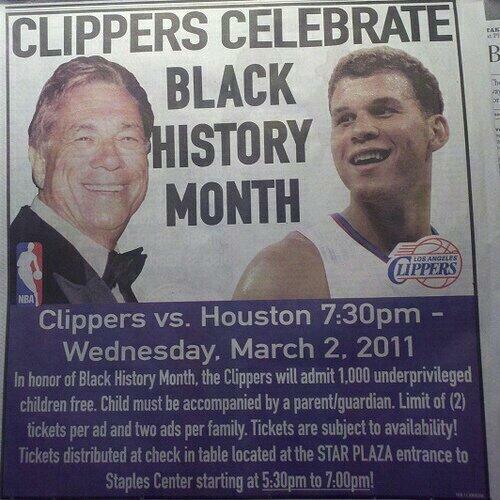 Then again...if this was Jim Buss, there would be protests outside Staples in 5 minutes. Why does he own the clippers then, like 90% of his team is black. Edited by bigfetz, April 25, 2014 - 11:28 PM. The official statement from the Clippers this evening on the Donald Sterling story is no comment. That should change tomorrow. What's the first word that comes after Donald Sterling's name when you type it in Google? To say he has history would be an understatement. What's going through the minds of Clippers players right now? What a trip. I was just gonna' post that about 10 minutes ago or so completely aside from Jemele Hill, but held back until I got back to this thread and didn't have to double post or edit my last post. Edited by Jackson, April 25, 2014 - 11:49 PM. Melo's Wife should be ashamed. She is mixed, but she's still part black. Why can't gifs be posted on twitter? Edited by Jackson, April 25, 2014 - 11:54 PM. He's going to get away with it. None of this is news to Clipper fans. Google "cognitive dissonance" RT @delmarvin1: what's clipper Darrel going to do? So racism's only bad if team's winning? RT @gharo34: its different now that the #Clippers are contenders. nowhere near as bad as the side shown in lawsuits vs. him RT @5thQuarterMag: This audio proof that Sterling is racist shows another side. Somewhere, Elgin Baylor is saying "I told you all". https://twitter.com/tmz/status/459920840943890433 … Who are these people Donald Sterling professes call him if they see a picture of his GF w/a black person? Edited by Majesty, April 26, 2014 - 12:40 AM. I wonder if Kaman/Young have ben heckled by Sternum. ^ He's referring to back when Kaman used to be black.